The Twinzee 2 in 1 Peeler, introducing more fruits and vegetables into your diet is easy. Make your meals more than just a daily ritual, but a genuine source of energy and vitamins for your family. Vegetarian, vegan, paleo or side dishes are easy and quick to make now. Unlike a spiral slicer, the Twinzee Dual Julienne & Vegetable peeler allows you to peel, julienne, slice and shred vegetables of any shape and size. It’s not four different tools – just a single peeler that makes cooking fun. Hide your food processors in a drawer! The Twinzee cutter is much handier. 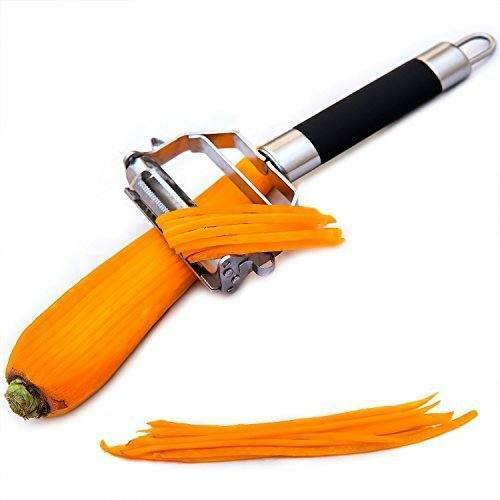 The original julienne peelre lets you create pasta or chips from your favorite vegetables! Carrot, parsnip, sweet potato, cucumber, orange, lemon, squash, apple, cheese… you name it! Ever tried to make zoodles (zucchini noodles)? Now you can! The razor-sharp serrated blade cut through any vegetables. Creates delicious-looking dishes for picky eaters. Best quality stainless steel that presents as a beautiful brushed metal. We want you to be completely happy with your julienne peeler and if you’re not we will refund your money, no hassle, no conditions. Click the Add to Cart button now and consider buying 2, they make a great gift.